One of Irish republicanism's most active propagandists in NZ during the '80s and '90s was Ciaran Marron. Raised in Catholic West Belfast, in 1971, at the age of 15, Marron witnessed intense gun battles between the "Provos" and the British Army. Marron moved to NZ in his teens but maintained a strong interest in Irish republicanism. The Workers Communist League's "Unity" of 14/10/1981 named Marron as a member of the Irish Republican Socialist Party. The Irish Republican Socialist Party (IRSP) describes itself as a republican socialist party and claims to be both Marxist and republican. The Irish Republican Socialist Party was founded on 8 December 1974 by former members of the Official Republican Movement, independent socialists, and trade unionists headed by Seamus Costello. A paramilitary wing, the Irish National Liberation Army (INLA), was founded the same day, although its existence was intended to be kept hidden until such a time that the INLA could operate effectively. Together, the IRSP and the INLA refer to themselves as the Irish Republican Socialist Movement (IRSM). Marron was active in the Hamilton Branch of the republican solidarity group, H/Block Armagh in the early '80s. He was H/Bock spokesman for the 1982 demonstrations outside UK consulates in Auckland and Wellington. Marron was constantly lecturing various organisations, ranging from the Maoist leaning, Waikato University Progressives Club, to Auckland high school groups. In an interview Marron gave to the Dominion Sunday Times of September 11th 1988, he explained that Information on Ireland (H Block's new name) had "moved from being an agitating group to one which concentrates more on information in NZ". No pacifist, Marron told the DST that "when British soldiers are killed in Ireland, it's a victory for the struggle". He went on to add "we will maintain our militancy against the symbols of British imperialism in this country and if that necessitates violence, so be it." 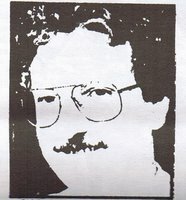 Marron returned to Ireland in 1989, but was one of of two IOI reps to an "Ireland-the Way forward" conference in the Europa Hotel Belfast. It was a radical affair, with 400 delegates ranging from Basques and Latin Americans to Swedes and people from "26 countries from the south". In 1995 Marron was back in NZ on a university speaking tour for IOI. Not sure what Marron's doing these days, but I note he signed a 2004 Irish internet petition circulated by the Ireland Palestine Solidarity Campaign.